The patented COMBO-SEP™ combines a Vernalift muffler and a highly efficient gas/water separator into a single space saving unit. Excellent for mid-range generators and propulsion engines installed at amidships or forward. 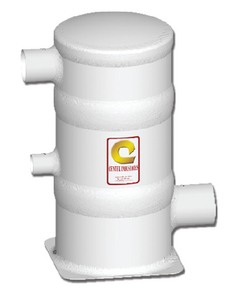 Recommended for above water line installations for maximum silencing and excellent water separation. For diesel engines.